It would appear that Soros is now attacking one of America’s favorite past-times: Football. 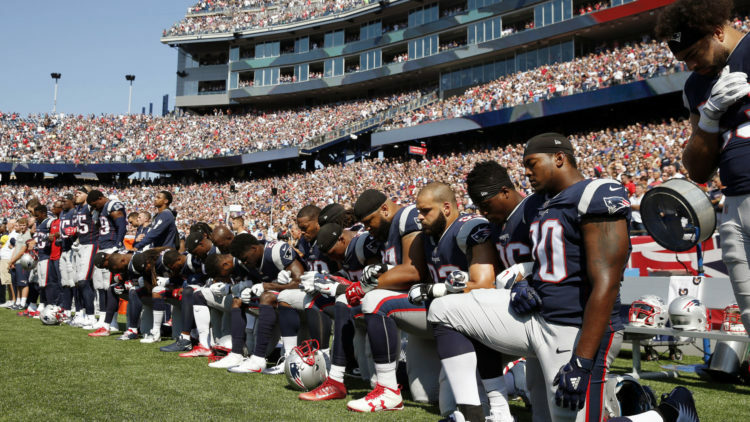 Lately we’ve had some issue with how the National Football League has allowed their players to kneel during the National Anthem, causing a great many people to turn the channel to avoid seeing the blatant disrespect exhibited by people who became unreasonably rich and successful in our country through sports. But now it appears that the players’ union has paired up with Soros-affiliated organizations to support anti-Trump causes. I don’t think I’m even surprised. Recently released tax documents indicate that the National Football League Players Association (NFLPA) donated $5,000 to Center for Community Change Action – a Soros-funded and anti-Trump group – in 2015. NFLPA also gave an additional $5,000 to Jobs with Justice in 2014, which is yet another Soros group. In 2013, the progressive group Los Angeles Alliance for a New Economy received $5,000 from the union. Center for Community Change was also listed as a recipient of funds. While this may sound like your every-day advocacy group, bear in mind that they also receive money from the likes of Planned Parenthood. But none of these donations should come as a shock. DeMaurice Smith is the head of the NFLPA and has a long history of giving money to the Democrats. He gave $3,300 to Barack Obama’s Presidential campaign between 2007-2008, and has given money to the Democratic Senatorial Campaign Committee, the Democratic Party of Virginia, the re-election campaign of the D.C. Democrat (non-voting) Eleanor Holmes Norton, Indiana’s Democratic Senator Evan Bayh and the presidential campaign of Democrat Senator John Kerry, back in the day. It shouldn’t come as a surprise that he would also be giving money to progressive liberal organizations while heading the NFLPA, but it still paints the NFL in a terrible light. They are supposed to be a group of all colors and to see that they are giving fair sums of money to George Soros makes me think that his ability to influence American culture runs a lot deeper than we would have originally thought. Knowing all of this, is it really a surprise that nobody has been punished for kneeling for the anthem? They’re simply making their beliefs clear to the American people.